If you’re like me, you’re probably really excited about all of the new offerings on the way at Disney’s Animal Kingdom (nighttime Kilimanjaro Safaris? Rivers of Light? Count me in.). We’ll finally get the chance to see this park come to life after dark every night, spending a whole day exploring new and old attractions alike. Along with that extra exploring, though, comes a few practical considerations – mainly, where to eat. 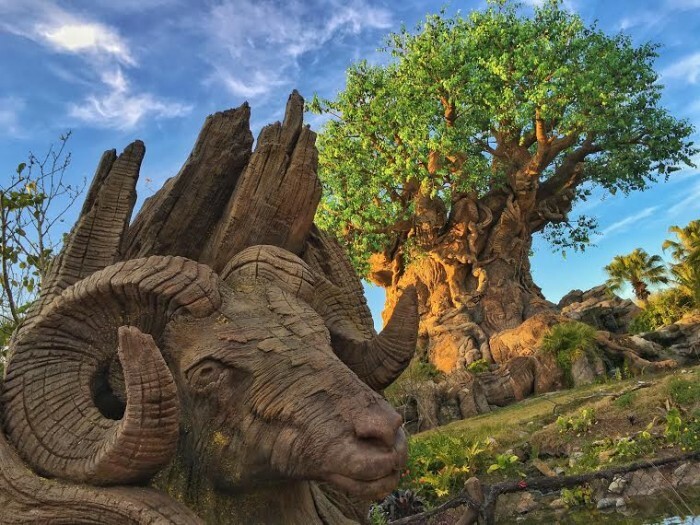 I’ve certainly enjoyed some great meals in Animal Kingdom over the years, but now I, like many of you, am faced with deciding where to eat multiple meals in one longer touring day at this park. To help tackle this problem, I recently dined with a few friends at the big three quick service locations in the park – Pizzafari, Flame Tree Barbecue, and Restaurantosaurus. Here, you’ll find a quick overview and dining review of all three locations (including some of the recent menu changes), and then a look at how the three compare to each other and the park’s various dining offerings to help you best decide where to head on your next trip. First, I’ll address the elephant in the room – why only these three restaurants? It’s pretty simple: they’re the most popular, centrally-located, and accessible (menu- and price-wise) eateries in the park. I love the current table service offerings at Animal Kingdom, and really enjoy snacking my way around the park. More than likely, though, you’re going to find yourself looking to grab a quick and relatively cheap meal before taking in the park’s upcoming nighttime entertainment. Dining at these three restaurants doesn’t require a lot of pre-planning and they cover a pretty wide variety of cuisines suitable for palates of all levels of adventurousness. I’m skipping Harambe Market in this review, as it’s been pretty widely covered recently, and is located a bit further back in the park. Same for Yak & Yeti Local Food Cafe – it’s pretty remote, featuring Asian cuisine not unlike what you’d find at Lotus Blossom Cafe at Epcot. That’s not to say either of these aren’t great options for you to consider, but if you’re looking for food in a pinch (as you arrive to the park for the evening, or running between attractions on a longer touring day), the three restaurants outlined here are your most likely options. Their newly-revamped menu features house-made pizzas (think: better than standard Disney quick service pizza), salads, and pastas. Our first stop of the day was Pizzafari. I thought we’d done a pretty good job trying to dodge most of the lunch crowds by showing up at 1:00 PM, but start to finish, it took us about 45 minutes in line and at the order window to receive our food; the very nice Cast Member at the register told us that some items are heated as they’re ordered to keep them fresher; cheese, pepperoni, and meat pizzas as well as salads are pre-made, so they’re faster to receive – something to consider if you’re in a hurry. My first few bites came from the Heart of Romaine salad with shrimp, topped with a standard creamy Caesar dressing and tons of crunchy croutons. I wasn’t a big fan of the shrimp on this salad, the same mild, slightly smoky ones served on the shrimp flatbread; they weren’t particularly flavorful, but they were cooked well (not too rubbery) and are a nice alternative to plain grilled chicken. We found the shrimp flatbread pretty innocuous – it didn’t have a ton of flavor considering the dollops of pesto, red peppers, artichokes, and onions. The flatbread was thin, slightly crunchy, just like what I encountered at Electric Umbrella, only this had far fewer toppings on it. I preferred the softer pizza dough of the Mediterranean pizza, which stood up well to the tomatoes, arugula, onion, and peppers. Overall, though, this pizza was pretty salty – olives and cheese dominated, but for 50 cents more than the plain cheese pizza, it’s a more adventurous option for vegetarians. It is a nice departure, however, from the standard Disney pizza you’ll find elsewhere on property – you can certainly tell this pizza (as well as the cheese, pepperoni, and meat pizzas) are freshly made here with better quality dough. The garlic knots were full of dried herbs, but a little dried out themselves – I craved more melted cheese on top; however, they’re a steal of a deal at $6.99 for six huge knots to share with your whole family, and an extra dollar will get you a small cup of garlic butter on the side. The winner, though, was the baked pasta – full of slightly-overcooked pasta, an herby but sweet marinara sauce, a decent portion of ground beef, and a hefty serving of cheese. Our last bites from Pizzafari came from the slightly soggy but super-coffee-laden tiramisu – skip the frappuccino from Creature Comforts for the day and just order this instead; overall, it was sweet and caffeinated goodness wrapped in a surprisingly light dessert. Barbecue favorites like smoked meats and sides dominate the menu here alongside fresh salads. Our next stop was Flame Tree Barbecue, a long-time favorite of mine (and many others). Here we encountered almost no line to order mid-afternoon (not surprising, but worth a mention – there are more order stations and windows here than at Pizzafari, and most items are ready to serve, so it tends to be a bit faster overall); we were on our way to the lovely outdoor seating area on the water with food in less than five minutes. First bites here came from the massive ribs, chicken, and pulled pork sampler platter – this is truly a remarkable plate of food for $19.99 (easy to share, considering it also comes with a piece of jalapeno cornbread, coleslaw, and baked beans). The pulled pork was moist and a crowd favorite, especially when mixed in with the sweet and spicy Flame Tree signature barbecue sauce. The chicken was deeply smoky in flavor from the spice rub on the skin and incredibly moist (even the best of restaurants often serve dry chicken – a lovely surprise here). The ribs were our least favorite of the three meats – three ribs in total that were the same flavor as the chicken, but tough to cut and very greasy. The baked beans are reminiscent of barbecue beans – more savory, less sweet; I remarked that they tasted a bit like Mexican charro or refried beans (an odd flavor with the barbecue, but definitely not bad). The coleslaw was way too sweet for my taste (admittedly, I’m not a fan of it anyways), but no one in our group liked it very much. Luckily, though, the jalapeno cornbread fit the bill as a side – dense, slightly sweet, and tons of pepper flavor with just a bit of a kick. On the side, we ordered one of my guilty pleasures at Flame Tree, their onion rings. For $3.99, they’re a good-sized portion to share, and we found ourselves fighting over them until they very quickly disappeared. Also available as a side here is a $6.49 side of French fries topped with pulled pork and cheese – think typical Disney French fries, slathered in that plastic-y orange cheese sauce, with a drizzle of Flame Tree barbecue sauce and a few green onions. We craved less cheese (yes, there can be too much of a good thing) and more barbecue sauce, but I’m sure this is a great novelty side to try (and could be made into a meal if you were looking for something smaller than their platters). The watermelon salad is the only straight vegetarian entrée on this menu – sweet and juicy watermelon, peppery arugula, slight bite from the cheese, topped with an acidic lime-based dressing; we found this was a great shareable salad to cut some of the richness from the rest of the meal (and, if you don’t have too much of a sweet tooth, could also double as dessert). 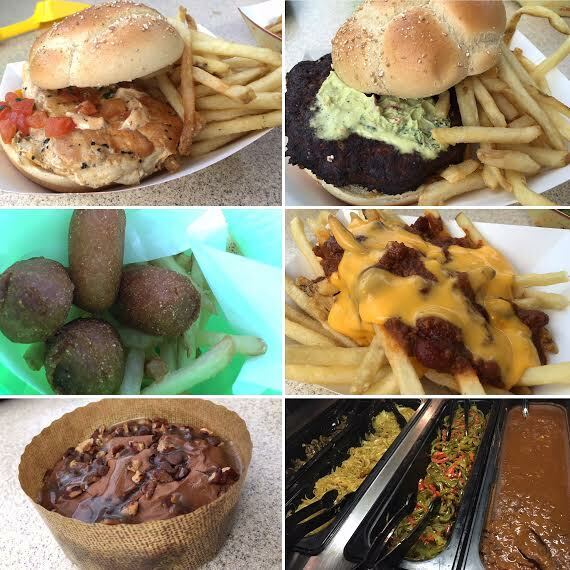 Burgers, chicken nuggets, hot dogs – typical theme park fare with few twists. If you miss Pecos Bill’s old menu, the newly-added toppings bar at Restaurantosaurus will help fill the void. Restaurantosaurus (L-R): Chicken sandwich, black bean burger, corn dog nugget kid’s meal, chili cheese fries, warm chocolate turtle brownie, toppings bar with sauteed veggies and vegetarian chili. Our last stop of the day was for an early dinner at Restaurantosaurus. I’ve never been particularly drawn to this location, but I was pretty intrigued by the recent addition of a freshly-prepared toppings bar, complete with sautéed veggies, vegetarian chili, guacamole, olive tapenade, and typical burger fixings. This restaurant features a pretty tame menu – chicken nuggets, hot dogs, burgers (beef or black bean), chicken sandwiches, and is generally very popular with families. It’s also one of the largest quick service locations in terms of the amount of ordering stations, which makes it very efficient. Food is also mostly pre-made, so we only waited a few minutes before jumping in to our meals. We hadn’t sampled a kid’s meal up to this point, and Restaurantosaurus features a cute themed meal, served in a bucket with a shovel, so we went for the obvious: corn dog nuggets. These are exactly the same as what you’d find at Casey’s Corner at Magic Kingdom, and hit the spot for greasy corn dog goodness. I found they were only elevated by dipping them into the chili cheese fries we’d ordered on the side (standard orange plastic-y cheese and Disney chili on fries; not the most adventurous side, but good for picky eaters). Since the beef burgers here are pretty standard (just like what I recently reviewed at Electric Umbrella), we went for the black bean burger and chicken sandwich. The chicken sandwich, sadly, was sawdust-dry and flavorless, served with a slightly spicy mayonnaise – we loaded up with veggies from the toppings bar to help elevate the flavor of both. The black bean burger (the new standard vegetarian burger offered all around Walt Disney World) had a great crunchy exterior, but was disappointingly mushy inside. The cheese and guacamole served with the burger were fine, but we jazzed it up with some sautéed onions, olive tapenade, and the excellent vegetarian chili – this made it a filling and tasty option for vegetarians and carnivores alike. Our final bite here was from the warm chocolate turtle brownie – tough on the edges (and not really served warm), but chewy and gooey, chocolate-y on the inside. After All That, Where Should I Eat? So what does all this mean? Where’s the best place to eat? Well, that’s up to your tastes, really. 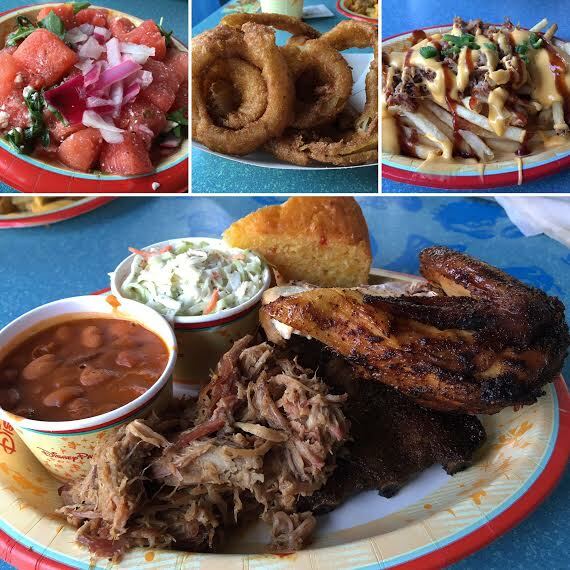 My favorite dishes of the day were the onion rings, pulled pork, chicken, and watermelon salad at Flame Tree Barbecue; the baked pasta at Pizzafari; and the toppings bar at Restaurantosaurus (seriously, the veggie chili was great stuff). Least favorites? Coleslaw and ribs at Flame Tree, shrimp flatbread at Pizzafari, and chicken sandwich at Restaurantosaurus. Your safest choice for kids or picky-eater adults is probably Restaurantosaurus, which is also the best bet if you’re in a hurry to eat (Flame Tree next, then Pizzafari). Vegetarians or those in search of less heavy, veggie-packed meals might consider sampling some of the freestanding carts like Mr. Kamal’s in Asia (samosas and falafel for snack credits!) in addition to the vegetarian options mentioned at these three locations. If you’re taking advantage of the Disney Dining Plan, the best bang for your buck comes from the Flame Tree sampler we tasted – I’d even venture to say that one meal credit here could serve two adults pretty easily. If you’re paying out of pocket and fine with sharing plates, Flame Tree and Pizzafari are tough to beat – a salad and/or side and one entrée would work for two adults or a smaller family with little kids. It’s also worth pointing out that it’s pretty easy to mix and match at these two locations to get a meal that everyone would love, just like you could do at Harambe Market. Any way you slice it or dice it, though, you’re sure to find a quality meal to fit your tastes and budget at Animal Kingdom. I won’t argue about the food at Restaurantosaurus, but it’s one of my favorites. The theming is fun and it always seems quick and quiet. Saying that yak and Yeti quick sevice and Lotus Blossom cafe both have similar Chinese food is like saying Le Cellier and Taco Bell both serve similar steak. Y&Y is hands down the best bang for your buck at Animal Kingdom when it comes to large portions of great tasting food. Also worth mentioning is that Flame Tree Barbecue, Pizzafari and Restaurantosaurus all take Tables in Wonderland, which is a nice savings if applicable. I totally agree with your positive view of Y&Y quick service. Once my teens discovered the Honey Chicken served there they wouldn’t eat anywhere else at Animal Kingdom. Which would be fine, except that now I can’t get my BBQ fix at Flame Tree Barbecue any more! On 4/8 we’re using just 1 QS credit at Flametree for 3 of us, ordering the Chicken/Rib combo with 2 Pulled Pork FFs. Might pay cash for the Watermelon Salad. Will update our results… probably fantastic since we’re grazers. It’s an awesome choice for the 2016 “Free Summer Meal” promotion. 1 credit valued at $19 can = that $35 worth of food above(tax adjusted) & feed 2+ ppl. Works similarly at Wolfgang Express(DD), Sunshine Seasons(EP), Peco’s Bills(MK) & other QS’s. Share some food & use leftover credits on other meals. Also allowed… converting 1 QS to 3 snacks (at same location only). Oasis Canteen at HS has Funnel Cake with Strawberry Topping and Soft-serve Vanilla Ice Cream, 3 cost almost $27 cash 😀 Or do this at the EP’s F&G tastings, SmokeHouse would work great. Thanks Tessa for some insight into some quick service locations at AK. I can’t wait to have dinner there while waiting for a night safari and Rivers of Light. My take away from your article is that Flame Tree is the place to be. The onion rings they serve are really good. I added them to my order last trip because I saw someone walk by with them. In my opinion they are as good as the ones served at 50’s Prime Time at a much lower price. Flame Tree doesn’t have the horseradish sauce but the BBQ sauce is an adequate substitution. I will order them every time I eat there from now on. I never noticed that watermelon salad on the menu. It sounds intriguing. 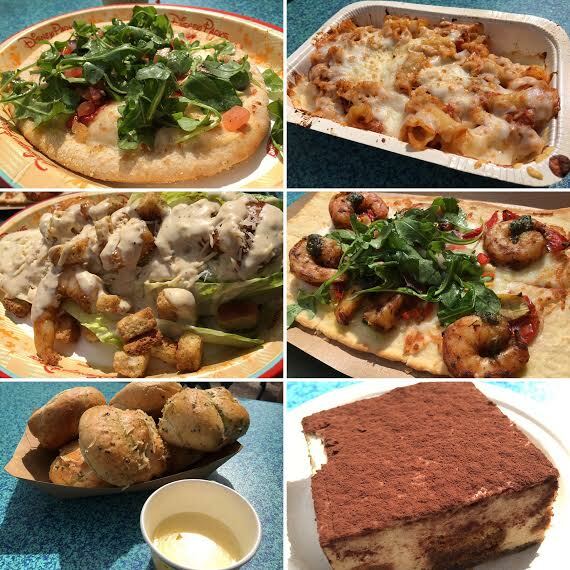 I don’t think that I can bring myself to try pizza or pasta in a theme park with the exception of the Italy pavilion in EPCOT. I can’t remember the last time that I ate a burger or nuggets in a park. Another dining option would be to go to Mara at Jambo house. The chicken pita is pretty good there and you can get zebra domes!